The Sudoku Player is for doing puzzles. Tap on a cell where you want to enter a number, when the cell has turned light blue tap the number button below. 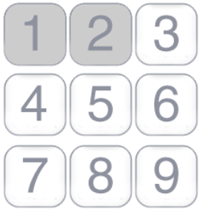 To change a number you have filled in, tap to choose the cell, then tap on a number button. If you tap the same number or the Del button the number disappears. When you tap the pencil button, the button changes to the memo button, and the mode changes to "Memo mode". In memo mode, you can enter/delete up to 9 memo numbers. When you tap the memo button, the button changes to the pencil button, and the mode changes back to the "Input mode". If you enter a large number (Input mode) in a cell with small memo numbers, only large numbers appear. When your Sudoku program thinks about whether your solution is correct or not, memo numbers on the screen are ignored. Tap on number buttons to enter numbers in cells. When all 9 of the same number (except memos) are in the 9x9 board, the button for this number turns gray. Tap on the "Del" button to delete numbers in cells you selected. Switch the mode by tapping on the "Pencil" or "Memo" buttons. After finishing a problem, tap the "Check" button and the screen will say "Congratulations" - if your solution is correct. If your solution is not correct the puzzle will show one point where it is not correct, then tap the "Check" button to continue to solve the puzzle. When you want to start a puzzle anew, tap the "Retry" button and a dialog box appears, then if you choose "Yes" all markings in the puzzle will be deleted. When you want to redo a step, tap the "Undo" button. Repeated tapping on the "Undo" button will return you to the start. If you wish to quit a problem, tap the "Quit" button, and a dialogue box will ask if you wish to "Save" the puzzle, to go back and solve it later; or "Quit," to abandon the puzzle. Next you will be returned to the problem list. This is the problem number. These icons show the difficulty level. From the left: easy, medium and hard. Tap on this icon to see the name of the author. These numbers show time passed from starting the puzzle, here 1 minute and 3 seconds. This is a list of the problem collections, each contains dozens of Sudoku puzzles. 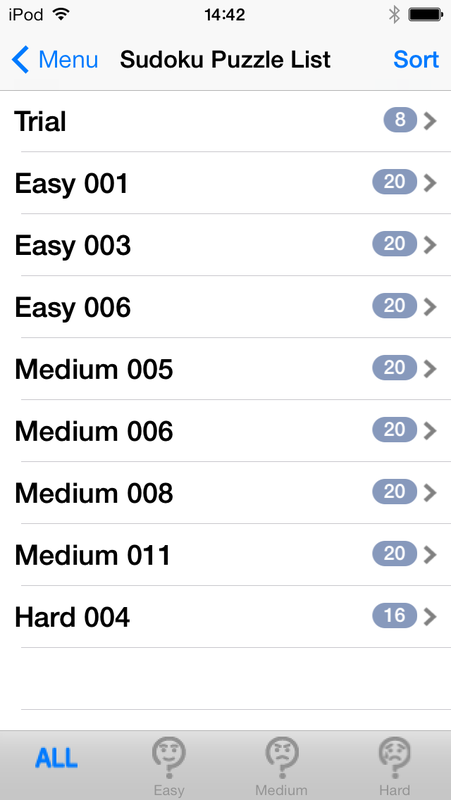 The numbers next to the problem collection titles show how many unsolved problems you have left. When you have solved all problems in a problem collection, the number changes to a check mark. Tap on the "Sort" button, upper right, to sort the order in the problem collection list. 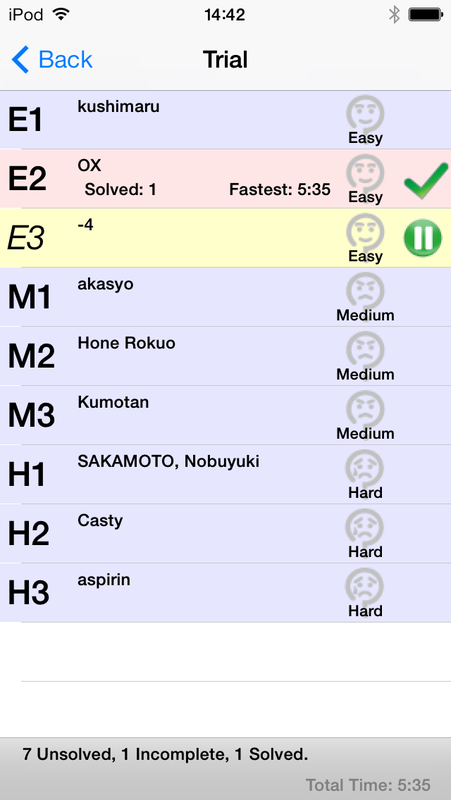 Tap on the "Easy", "Medium," or "Hard" button on the bottom, to choose problem collection lists of the appropriate difficulty. Tap on the "All" button to display all problem collection lists. This is the list of problems you can play. A light blue background shows "Unsolved" problems, light yellow is for "tried but not solved," and pink is for "Solved" problems. Each puzzle shows, from the left: problem number, author name, difficulty level. The bottom row of solved puzzles shows how many times this puzzle was solved and the record solution time. Right column: green check for solved and || for tried but not solved puzzles. You can continue solving the puzzle or start over. The puzzle you worked on most recently has its problem number in italics. The bottom line shows your record and status. "Total time" turns clear when you have solved all the problems. 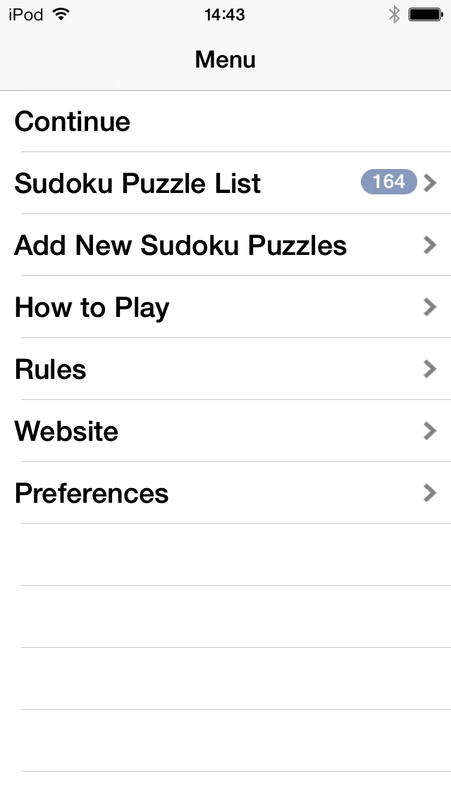 You can purchase and add more problem collections that contain dozens of Sudoku puzzles at the App Store. When you choose and tap on a problem collection, your device will connect to the App Store. Please follow the purchasing procedures displayed on your screen. Here you can go to the other screens, problem list, tutorial, rules, and preferences. If you tap "Website", you will quit the application and go to the Nikoli website. 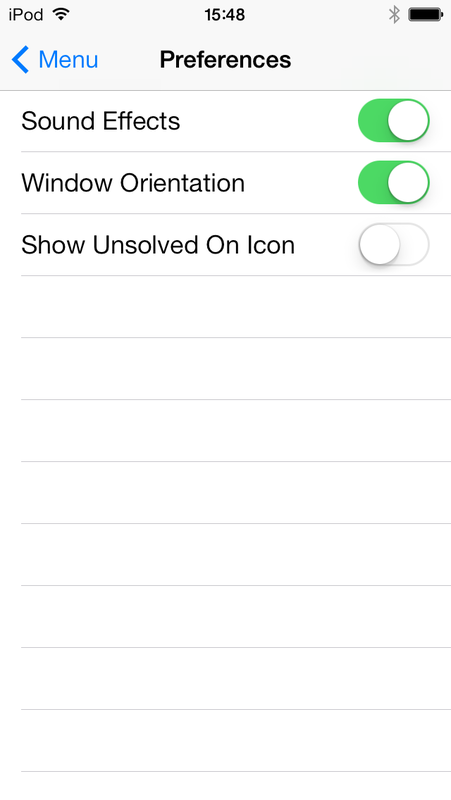 Here you turn the sound on or off, lock or unlock the orientation of the Sudoku player, and show or don't show the number of unsolved problems on icon.